Sometime last week I awoke to remember that I hadn’t been shopping in a while; no fruit left to go with my granola! 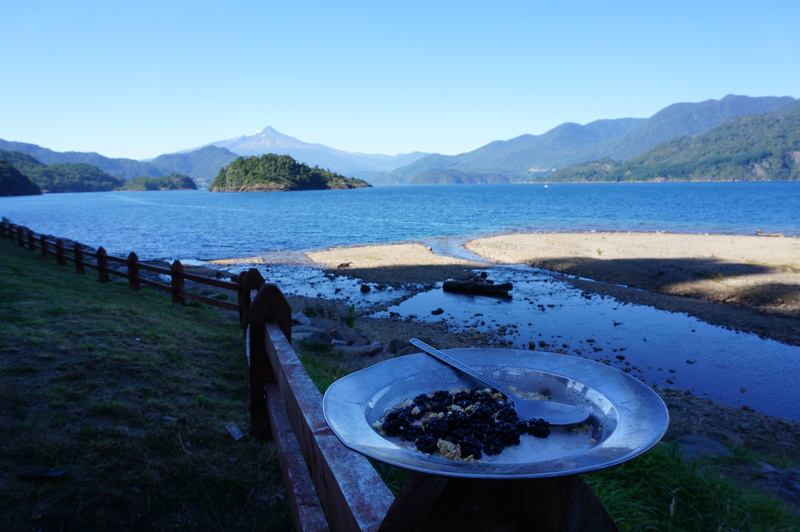 Looking around I remembered that pretty much every roadside or riverside in Chile is burgeoning with the most delicious blackberries; Alexander Supertramp really was onto something. The ground breaking realisation that I can wake up and pick a bowl full of delicious berries for breakfast has since revolutionised my daily routine. So simple, yet so delicious. I have a lot of hitchhiking karma to pay back. From the time when I first hitched into Alaska through to thumbing it across the Nullabor plain and up the West Coast of Australia, there have been a lot in between. It is my pleasure to pay back some of the good will. When I am alone in the van, I can listen to audiobook spanish lessons, as soon as it ends I can pick up a hitchhiker and then practice all the questions and phrases I have just learned. It really is the perfect setup- I have a captive audience to practice with. I can even fool people into thinking I speak ‘good’ Spanish, as long as they don’t deviate from the script of questions and answers I know how to respond to. Everyone is happy, they get where they need to go and I keep on learning and meeting new people. The world works better when things are based on co-benefits. Cruising along the lakeside a few days back, my little 1000cc engine trundling along with 4 hitchhikers jammed in somehow; we were discussing the idea that our slow speed was actually quite optimal, and going any faster would instantly detract from the experience. The view was simply too good to speed past. 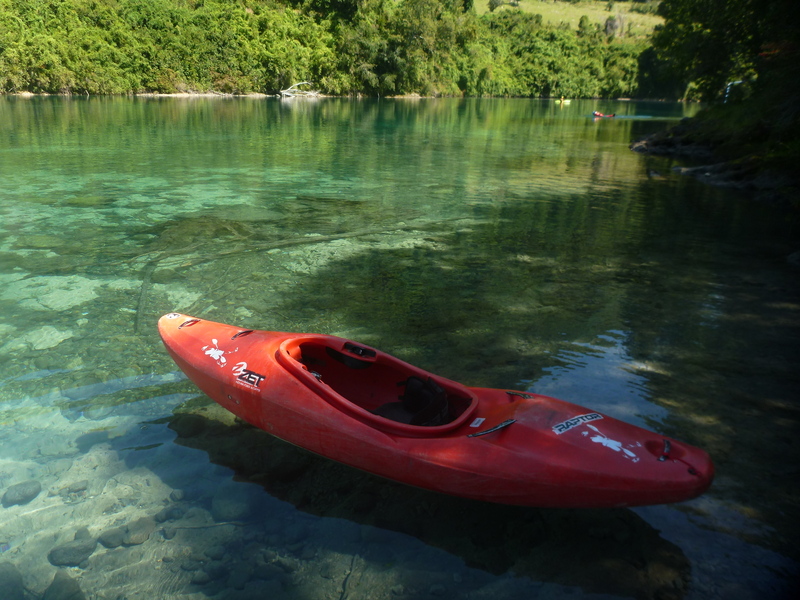 Last week was spent on Rio Fuy, an incredible stretch of whitewater, lake fed so the water levels are super reliable. Normally broken into three sections: Upper with 4-6 waterfalls (depending how far you go), between 5m and 10m in height. Middle Fuy with a 15m waterfall into a committing gorge section full of stunning class 4/5 rapids and Lowe Fuy: Nice class 3 water than you can boogie on down in no time. I arrived at Rio Fuy one afternoon just in time to see my buddy Marlo taking off the river, a super lucky coincidence. After ejecting all the hitchhikers from my van we had a quick spot of lunch, it was then he asked if I was ready to run the Middle Fuy, something I had been thinking about for a while, but hadn’t fully psyched myself up for, and had in no way expected to be jumping on this very afternoon. Yup lets do it. Nervous as hell we put on and started down the section. A few solid rapids later we were looking down the gauntlet of a 50ft drop into the gorge. This waterfall is in a place where due to rocks and cliffs, you can’t see the bottom of it until you have run it. You can only peek from a precarious cliff ledge high above, plan your entry line and hope all is well on the other end. Right above the waterfall is a deadly looking chute rapid, which most people walk around because they enjoy living, however this means that to get down to the waterfall its necessary to ‘seal launch’ from a rocky ledge 5m above, into a small eddy of calm water only 5 or 10 meters back from the lip of the fall. Needless to say, you don’t want to stuff up that seal launch- going off the 50 footer upside down, sideways or out of your boat would not be a pleasant experience. From the tiny eddy, you peel out into strong current, hold your line steady while the river does a quick 90 degree turn, try not to get pushed into the wall, and then your there falling, falling and landing. The first time I ran it my spray skirt half imploded on impact, after quickly refitting it underwater I was able to roll up and see the giant I had just descended (If I had rolled up before refitting the skirt, my boat would have filled with water, which would have made for some very difficult times, especially if I was swept down the rapids right below. 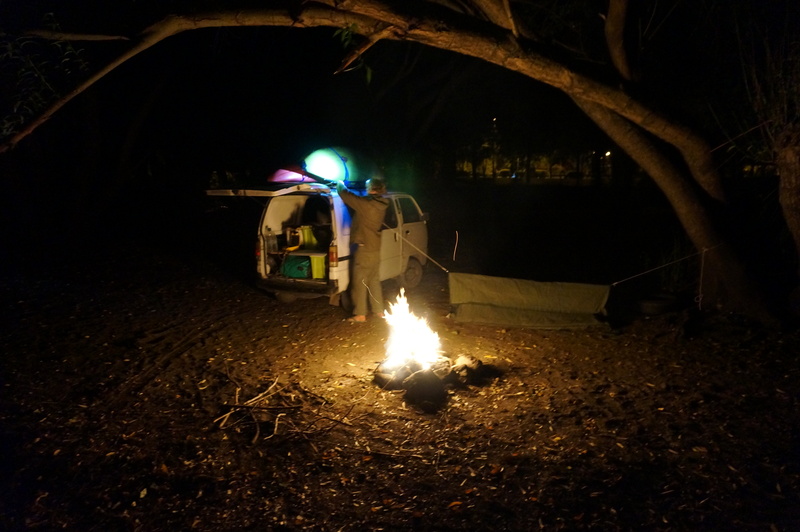 A few nights camped on the lakeside beach in Chosheunco and the riverside in Puerto Fuy. Sharing our superb campsite and camp fire with a chilean family, it doesn’t get too much better. We decided on the second day to link all three sections together, to make a full big day of paddling. Upper, Middle and Lower- Todo (All) Fuy! 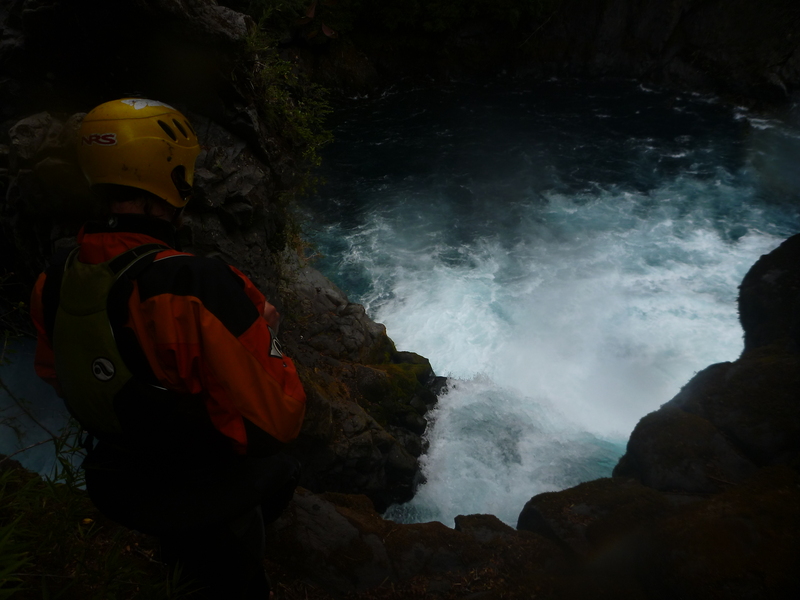 This involved portaging around the behemoth waterfalls of Huilo Huilo (50m) and Puma (30m, Evan Garcia recently broke his leg trying to do a first descent). This would have been a fairly straightforward matter, had it not been for an uncooperative security guard at Huilo Huilo. They have set up trails and charge entry to tourists at both these waterfalls and Mr. Security just did not seem to like kayaks. After paddling the Upper Section we were in the process of jumping the fence when he sprung us. Ok, so now we left their establishment. We went back and lowered off the bridge down to the riverbank. We were starting to walk down the riverside instead, but he seemed to have a problem with this too. After some discussions (mostly by Marlo) we just started walking away from him, towards our goal. He went around via the track and then cut us off. Blocking our path, calling for backup on his walky talky and dialling for the police on his phone, after some pleading and more discussions we once again conceded and headed back up, in order to get out of there before the police arrived. We legged it out of there, into the forest on the other side, hoping to find a way down to the river from there. No luck. Sheer cliffs dropping down to the riverside made access impossible, we would have to walk a long way downstream if we were to get access from that side of the river, thus giving away our goal of running the whole Fuy. We decided to roll the dice at Huilo Huilo one more time- this time though we would do some scouting, ascertain the location of Mr security before we head in, keep down low, hopefully out of sight and once were – just leg it. If we get past the point of no return just run- try to get onto the river and out of his clutches. After jogging down what felt like a thousand steps with our kayaks, we had made it undetected. A few of the Chilean tourists at the bottom were more than happy to help us lower our boats down the rocks and onto the river. Success! Second time round running the Middle Fuy I felt much more confident, hitting a perfect line off the 50 footer then stomping our way through the gorge below. Todo Fuy mission complete, a huge day finished off with a pile of Empanada’s for dinner and a fire by the lakeside. Feeling a little bit sore from so many waterfalls and such good paddling, in need of a couple of days off, it’s now time to complete the rugged drive down Caretera Austral to the legendary Futaleufu.